During the Winter months, our ability to exercise can be reduced due to weather, darkness, colds and flu. The colder weather also increases our appetite for heavier foods. These factors can lead to winter weight gains, in the vicinity of 2-5kg. One of the earliest research studies established that Nordic Walking consumes approximately 400 calories per hour, compared with 280 calories per hour, for normal walking, an average increase of 20%. When fully utilising the correct technique, a 46% increase occurs. (Cooper's Institute, Research Quarterly for Exercise and Sports 2002 publication). Taking a refresher class will ensure your technique is at it best. Including weights into your exercise life can also aid in weight management. June will alo be speaking on metabolism and exercise as it relates to weight management at the upcoming World Nordic Walking Day. Current health research indicates that lifting weights is an extremely important part of maintaining our body's strength, posture & can aid in weight control. Do you feel that you could benefit from doing weights, but feel intimidated by going to a gym? This fully supervised class is designed to enhance your Nordic Walking with a focus on the tum, bum & thighs and deep stretching. Learn how to correctly do gym exercises and understand how "less is more". Certainly a different take on 'walking', but no less disrespectful, "Walking the Labyrinth" is a way to connect, contemplate, problem solve or reflect within ourselves. The Labyrinth is one single pathway, to its centre and back. Many newly made labyrinths exist today, in churches and parks. 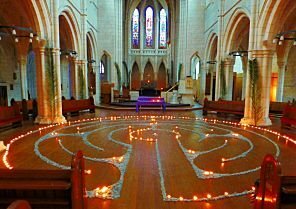 This labyrinth was set up in St Matthew-in-the-City, in the days leading up to Easter. Beautiful ... and a haven in our busy lives. 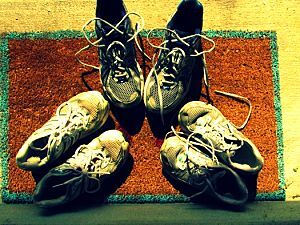 Nordic Walker, Alison Cameron, is coordinating the collection of old walking & running shoes. These will be recycled and sent to Northland, for children who need shoes. The shoes maybe worn on the bottom, but if the uppers look good, these are suitable. Pop them in the washing machine to clean them, but if you can't, hand them in anyway. Please contact Alison if you have any shoes to donate. Nordic Walking is a total body exercise, aiming to integrate the upper and lower body movements in a natural way. We often think that the movement is all about the arms, instead of imagining the movement starting from the shoulder region. In this picture, you can see how the arms really start at the shoulder blades, allowing the torso to rotate. This ensures that the shoulder, chest, back and abdominal muscels are all involved. 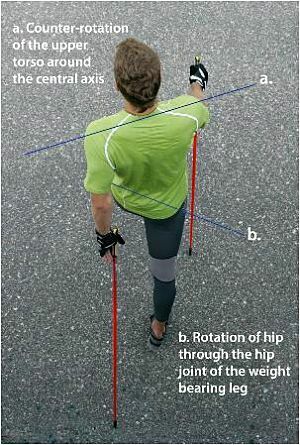 The hip also moves more freely allowing the stride to lengthen. Viola! Total Body Walking! 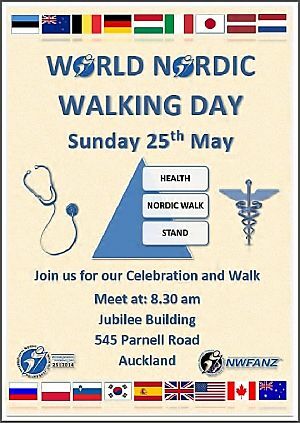 Over a 24 hour time span, NZ is the first country to celebrate Nordic Walking with this World event. 30 other countries will also be also participating. To start the day, join us for a 5km or 10km Nordic Walk, followed by refreshments, recognitions, spot prizes and giveaways. Among the Guest Speakers will be "Weather Man" Ken Ring. Ken's opinions have often courted controversy, as he predicts the weather by different means to the conventional meterological service. Ken's talk is not to be missed!